Asia has now a strategic role for the world of coffee. From 12-15 of April the attention of the Asian market will be in fact on HotelAsia2016, the 20th International Exhibition of Hotel, widely regarded as Asia’s most established and most comprehensive trade exhibition of its kind. Featuring leading brands from all around the world, its 2016th edition will integrate a broad array of international foodservice and hospitality equipment, machines and accessories, making it a well-positioned one-stop business platform for buyers in Asia and beyond. 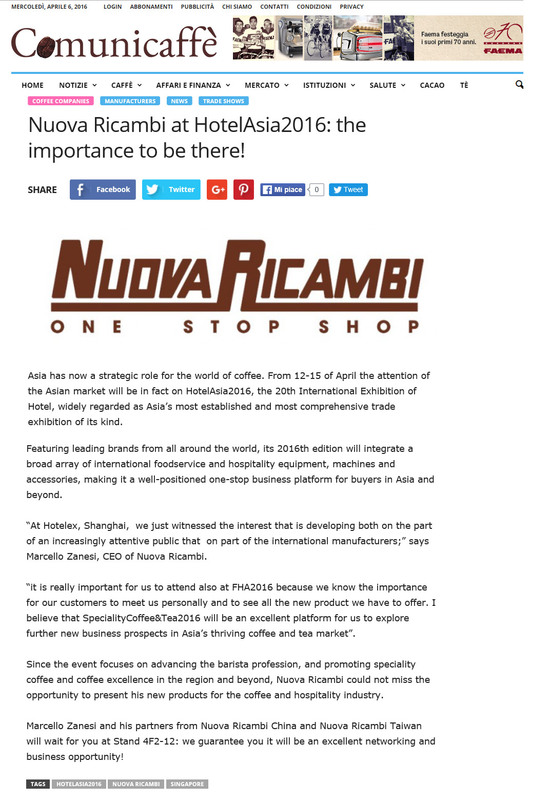 “At Hotelex, Shanghai, we just witnessed the interest that is developing both on the part of an increasingly attentive public that on part of the international manufacturers;” says Marcello Zanesi, CEO of Nuova Ricambi. “it is really important for us to attend also at FHA2016 because we know the importance for our customers to meet us personally and to see all the new product we have to offer. I believe that SpecialityCoffee&Tea2016 will be an excellent platform for us to explore further new business prospects in Asia’s thriving coffee and tea market”. Since the event focuses on advancing the barista profession, and promoting speciality coffee and coffee excellence in the region and beyond, Nuova Ricambi could not miss the opportunity to present his new products for the coffee and hospitality industry. Marcello Zanesi and his partners from Nuova Ricambi China and Nuova Ricambi Taiwan will wait for you at Stand 4F2-12: we guarantee you it will be an excellent networking and business opportunity!